Simple treatment may be carried out with a removable appliance (a plate that can be taken out to be cleaned). Removable braces have delicate wires and springs attached, which move the teeth using gentle pressure. 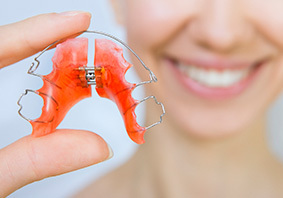 They may be used to correct an early problem, but because they can only carry out simple tooth movements, they cannot manage complex treatment. Removable braces need to be worn all the time except for cleaning or sport. Most patients will require fixed appliances later on to allow for better alignment and fit.